Grabau International is delighted to announce the price reduction of the 2017 B-Yachts Brenta B42 ‘JOLE 2’. • Composite carbon fibre metallic grey coloured hull. • Teak decks with grey caulking. • Carbon boom with integrated furling system. • Cariboni Power pack for the mainsail sheet, vang and traveller. • Pushbutton sail controls at both steering pedestals for the Cariboni power pack. • Twin carbon steering wheels. • Volvo D1-30 27 hp diesel engine with low engine hours. • Saildrive gearbox with a 2-blade folding propeller. • Doyle Sails’ fully battened Taffetta Technora flat head mainsail. • Doyle Sails’ Taffetta Technora self-tacking jib on a roller furler. • Electronics by B & G with autopilot. • Fusion sound system with cockpit and cabin speakers. • Galley area with a sink, gas stove and refrigerator. • Folding carbon bathing ladder. “Being amongst the major players both in term of design and boat construction … of the last 20 years of high-tech design and built boats process, this team of high professional individuals has decided to team up to propose a new breed of stylish, high performances, easy to use, semi-custom built boats blending past experiences of typical large custom projects solutions into something new. This team strongly believes in spectacular products, which necessarily needs to be supported by high technical standards both in terms of pure naval architectural thus performances and construction solutions. This is the mission. High weight stability, very generous sail plan, great cockpit comfort and pure sailing pleasure mixed with style. The simple pleasure to spend your time sailing differently. Controlling the sail trim completely by button-power is a novel experience and a little unnerving when you are trying to remember which one does what (the hydraulics’ response to a command is fast enough to allow you to apply a quick touch of trial and error), but this is an aspect of push-button sailing that would soon become second nature when you spend enough time sailing the boat. And “One of the objectives is trying to minimise the time it takes to go sailing,” said Lorenzo Argento, co-founder of the Italian company Luca Brenta Yacht Design, while visiting Sydney for the initial sea trials of the two new B42s. 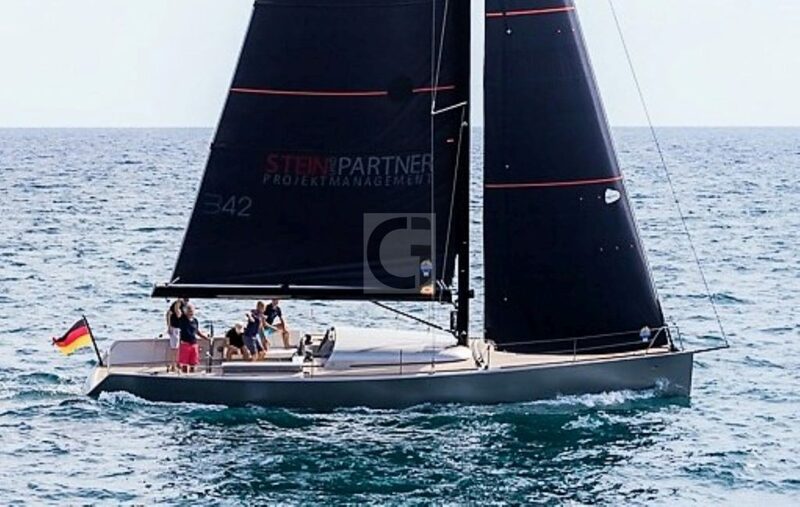 If the B42’s Italian dayboat looks and minimalist setup make you think “Wally Yachts”, perhaps it will come as no surprise that the B42’s designers were involved in the ground breaking early days of those bigger craft. “We decided to go for a highly ballasted boat and made it as narrow as we could, while still with accommodation and deck space,” Argento explains. “We wanted a very balanced hull shape, because it has to be easy to drive and particularly because such a powerful boat will heel considerably, you really like to have a symmetrical hull shape so it doesn’t go ‘funny’ when it heels over, which is what more dedicated downwind boats do when they sail upwind. The B42’s ratio of sail area to displacement is quoted as 29.9, while the displacement to waterline length figure is 108. Lorenzo Argento says he and his design partners decided to set up production of the B-yachts only after they unsuccessfully sought a builder. “We were strong believers in this concept but nobody wanted to build these boats, so we found ourselves right in the middle of it. The hull is infused carbon fibre and E-glass epoxy over a Corecell foam core. “We lay all the dry fibres and then we apply the vacuum bag and by sucking the air out and the epoxy resin in, have control of the amount of resin and the weight differences between the boats is minimised,” says Argento. Built in female moulds, the use of the infusion process allows the boats to be spray-painted rather than gel coated.